Always Keep CLOWN KILLIFISH in Good Company! Clown killifish is a very calm and quiet fish and can stay with other species without any problem. It is small in size, growing just up to 1.5 inches and is mainly found in fresh water. The scientific name for clown killifish is Pseudepiplatys (Epyplatys) annulatus. It is also known as rocket killifish among the fish keepers. Clown Killifish is a non-annual killifish, so its life cycle is not very short like many other varieties of annual killifish. It requires a lot of bright light every day, which intensifies the color of the fish. The fish is comfortable with aquariums which are planted heavily and provide clean and soft water. Like other varieties of killifish, this fish also loves to jump. So you need to provide a tight lid to your aquarium otherwise it can easily access your living room! Clown killifish will happily eat live food like white-worms or brine shrimp and occasionally they can eat flaked or frozen food. You should provide mainly the food which will float in the water so that the fish can easily catch it. Usually, the males are bigger in size than the females. Males have bright colors with black or yellow stripes which resemble a bumblebee. The fins are also covered with red and blue stripes. The females are mostly in dull colors and they are not as active as males. You can keep clown killifish in a community tank but you should select the other species very carefully. 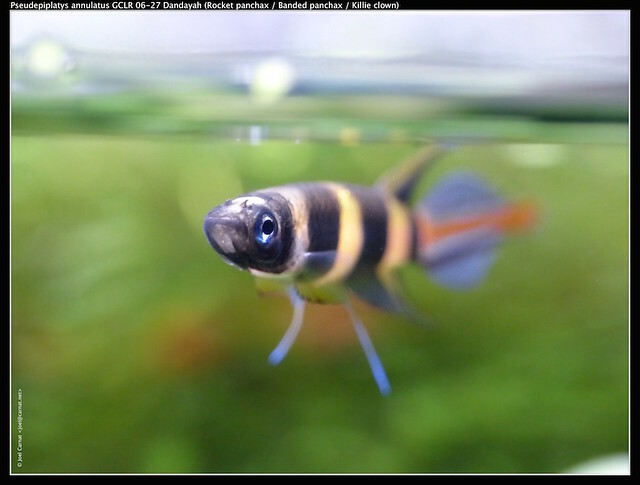 As clown killifish is a peace-loving shy fish, you should not put it in the tank where there are vigorous and powerful fish species. You can safely put it along with Corydoras, dwarf cichlids, or other varieties of killifish which are small in size. There are two opinions about the conditions of water for clown killifish. Some people think that the fish is very sensitive and it requires clean and well-treated water. Some others differ and say that the fish can sustain in hardy water and can tolerate variations in the conditions of water. It is always advisable to provide a clean environment to the fish to avoid health problems. While breeding the fish, you should provide a separate tank. The temperature of the tank should be around 80 °F and the ph level of the water should be around 5.5. In contrast to the normal aquarium, this special aquarium should be provided with dim light and a lot of floating plants covering the water surface. There is no necessity to add a substrate and normal filtration devices are sufficient. It will breed in the aquariums at a very fast rate. The female will lay its eggs on the mops or on java moss. It will take about two weeks for the eggs to hatch. As the fish loves to swim below the surface of the water, you should provide floating plants which will help the fish for hiding. Before transferring to the breeding aquarium, the fish should be 'conditioned' by providing a lot of live food. In the breeding tank, you should arrange two females and one male. The spawning is almost continuous every day and will continue for up to two weeks. The eggs should be removed very gently and once the spawning period is over, the adults should be transferred to the normal aquarium. After spawning the females will become tired and weak and need special nutrition. The eggs should be shifted to a small tank and that tank should be checked thoroughly every day for locating fungus, which should be immediately removed. You can feed the fry with infusoria initially and then you can feed them baby brine shrimp. You can gradually increase their diet as they grow and after about three weeks you can offer them the food of adults. The fry grows very slowly and they are delicate. You should always put them in a separate tank because they can be attacked and eaten by aggressive species of fish. Even the adults are sometimes so small in size that they can make a snack of other big sized fish. The only precaution while keeping clown killifish is to ensure that they are kept in good company. They are slow moving and peacefully living species and fast-moving or aggressive fish will put them under stress.